I think I know now how Bilbo Baggins must have felt in Tolkien’s “The Hobbit.” My companions and I have set out on our own mountainous journey to try to attain a treasure. The treasure in our case is not a pile of gold guarded by a dragon, but rather the gratification that comes with reaching the summit of Mount Kilimanjaro. Instead of facing trolls and fighting goblins, we are battling steep climbs and the fatigue that accompanies seven- to eight-hour hikes. Furthermore, I’m not sure of the height of the Lonely Mountain, but I’m pretty sure I don’t remember reading about Bilbo’s having to worry about acclimatization and altitude sickness as he ascended the mountainside. Our party is two days into the climb, and we have reached an altitude of 11,300 feet. Instead of facing trolls and fighting goblins, we are battling steep climbs and the fatigue that accompanies seven- to eight-hour hikes. Let's see Dickey throw a knuckleball past Sauron. The lidless eye sees all. 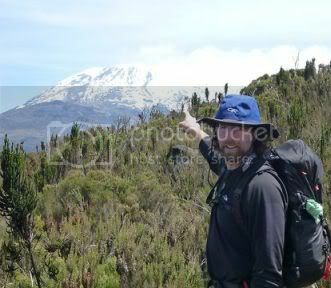 I'm told that the biggest challenge in bagging Kilimanjaro is a lack of clean drinking water. Does anyone remember if Bilbo had the trots on his way to battle Smaug? I think maybe in the unabridged version. I think "At least we have Dickey" we be a common refrain among BTF Mets fans this year. Kilimanjaro ranks as RA's second-most impressive endeavor in his lifetime. @5: Yes indeed. A great player to watch. One does not simply knuckle into Mordor. At least you know Sauron will come up swinging - one does not simply walk out of Mordor, either. Dickey's Mets. No rings to find them. No rings to bind them. Is he going to build a bridge between the two peaks? The Mets should sign Julio Franco. He's gotta be eleventy-one by now, right? If you like your fantasy epic, there are a couple of threads in the forums about the Malazan, Book of the Fallen series.